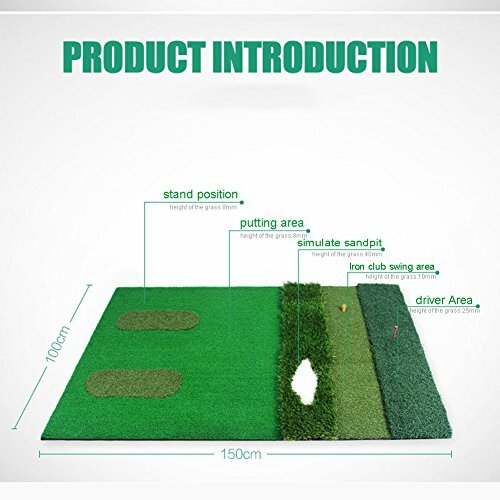 PGM Mutil-functional Golf Practice Mat Driving Range Golf Hitting Mat----3.3ftX4.92ft by PGM at Village Green Golf. MPN: HSCRT235. Hurry! Limited time offer. Offer valid only while supplies last. It will take 7--15 days to you,hope you will enjoy it. 3'x5' GORILLA Perfect ReACTION Golf Mats. Use Real Wood Tees. At Last a No Bounce, Hit Down & Through Golf Mat. The Next Generation in Golf Mats. No Rubber Tees Required. No Club Shock 1 3/4" Thick.